Internationally award-winning short film PATH OF DREAMS will premiere on CHOPSO on April 28 at 4 p.m. The Japanese American National Museum, CHOPSO, and ELEVEN ARTS Studios are proud to present Path of Dreams by Tamara Ruppart. In poetic Japan, Komachi strikes a tantalizing bargain with suitor Shosho. If he agrees to write poetry with her for 99 nights, she promises they will create a love more beautiful than poetry. Every day he must ride to her home, and when the sun sets on the 99th night she will take him as her lover. For 98 nights, they journey through poetry, exploring their hearts and minds, as their love and desire grow in anticipation. On the 99th night, Komachi joyfully awaits her lover. But as she watches the sun set, Komachi moves from disappointment to anger, until a sense of mystery fills the stillness in the air, and heartbreak takes hold of her heart. In her grief, she will carry Shosho with her as she walks the path of dreams. "Path of Dreams" has won/been nominated for over twenty three awards at film festivals around the world, including the Best Short Film at the LA Women’s International Film Festival and Best Short at the Winter Film Awards in New York. The film is the directorial debut of Tamara Ruppart and is written by acclaimed playwright Velina Hasu Houston. Tamara Ruppart is a stage director and "Path of Dreams" marks her transition into the direction of film. Velina Hasu Houston, highly-esteemed Japanese-American playwright, brings her award-winning writing to the screen for her first Japanese film "Path of Dreams." Houston’s work focuses on the shifting boundaries of identity with regard to gender, culture, and ethnicity, often embracing a transnational view of identity based upon her own Japanese and American background. Ko Mori, the film’s producer, produces film and television in Japan and the United States, and often creates projects that showcase themes of identify, particularly across cultures. The production team believes in the power of cross-cultural collaboration and storytelling to recognize the strength in diversity and to celebrate the human spirit. 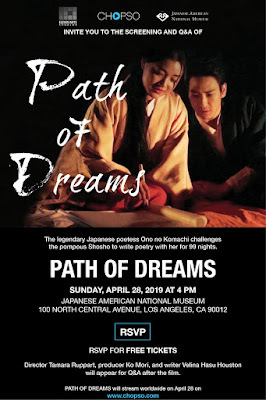 The Japanese American National Museum, ELEVEN ARTS Studios and CHOPSO will present the FREE SCREENING of Path of "Dreams" on April 28 at 4:00 p.m. at National Center for the Preservation of Democracy at the Japanese American National Museum, 100 N. Central Avenue, Los Angeles, CA 90012. The team behind the film, including director Tamara Ruppart, producer Ko Mori, and screenwriter Velina Hasu Houston will appear at the Los Angeles for a Q&A after the film screening. "Path of Dreams" will stream worldwide day-and-date on April 28 on CHOPSO*. CHOPSO is the ultimate streaming destination for English-language Asian content worldwide. Movies, documentaries, short films, TV and digital series..."All Asian, all English, 24/7." The mission of the JAPANESE AMERICAN NATIONAL MUSEUM is to promote understanding and appreciation of America’s ethnic and cultural diversity by sharking the Japanese American experience. For more information about the museum, go to janm.org. ELEVEN ARTS Studios is an American film production and distribution company in Los Angeles, founded by Ko Mori. The company uses film to bridge connections between varying cultural and global audiences all over the world. 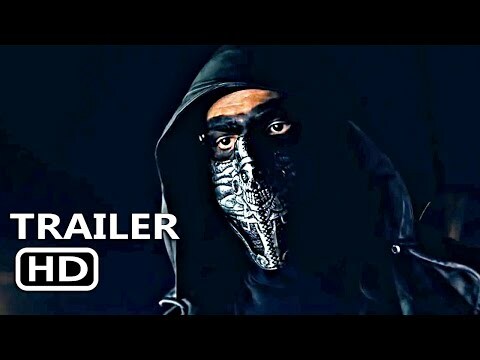 Previous credits include: Lords of Chaos (Jonas Akerland, Rori Culkin, Emory Cohen), Downrange, Uzumasa Limelight, Man From Reno. Currently in production: Prisoners of the Ghostland (Sion Sono, Nicolas Cage, Imogen Poots), MAXX (Kane Kosugi, Jason Patric).